FeedBurner is a free web feed management service is provided by Google. It can be used to manage feed readers of your blogger blog. 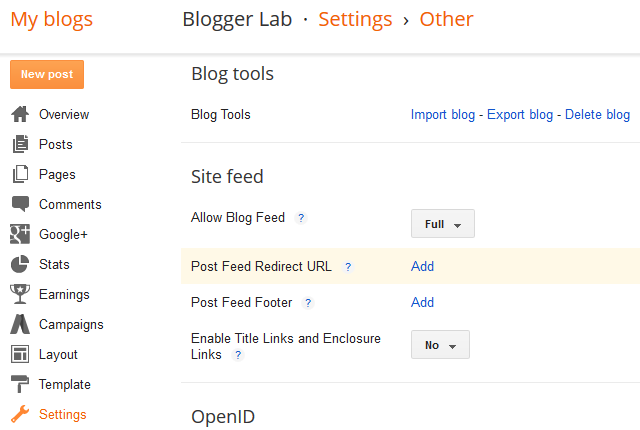 This tutorial show you how to redirect your blogger post feed into your FeedBurner URL. First signup with FeedBurner using your Gmail account. 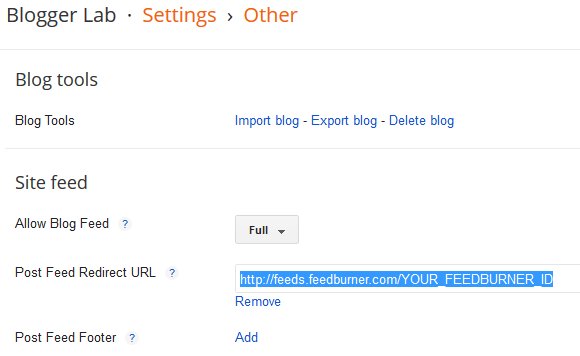 Now create your FeedBurner feed URL completing easy to understand steps in Feedburner. Now go to "Settings"  "Other" of your blogger blog. Under "Site feed" settings, you can see "Post Feed Redirect URL" setting. If you have burned your post feed with FeedBurner, or used another service to process your feed, enter the full feed URL here. Blogger will redirect all post feed traffic to this address. Leave this blank for no redirection. Click on "Add". Now paste your FeedBurner URL into that text field. It will automatically redirect to your FeedBurner URL.